Participants listen at the annual CREE Insight Summit. Dr. Lauri M. Baker presents about social media use and analysis. The Center for Rural Enterprise Engagement hosted its third annual new-media marketing conference, the Insight Summit. 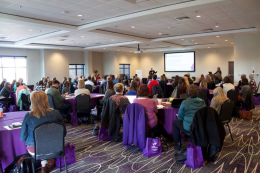 The conference featured topics related to new-media marketing, including storytelling across platforms, basic and advanced analytics, social media strategy, visual content, e-newsletters, and selling online. 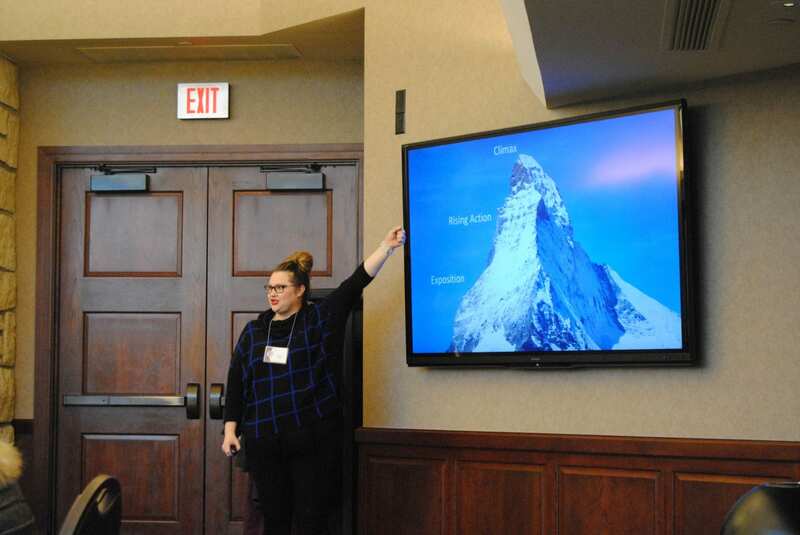 The 2019 Insight Summit differed from past events by hosting agricultural communicators and researchers from across the country to present recent research to participants. Academic researchers included: Courtney Meyers, faculty at Texas Tech University and 2003 K-State agricultural communications and journalism alumna; Angie Lindsey, faculty at the University of Florida; and Shuyang Qu, faculty at Iowa State University. 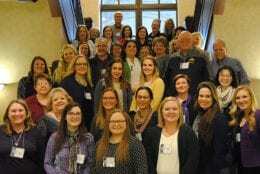 Graduate student researchers included Deanna Reid, K-State; Levy Randolph, University of Florida; Brittany Bowman, Oklahoma State University; and Maggie Elliot, Texas Tech University. Attendees of the 2019 Insight Summit. The center is a unique resource for rural and agricultural businesses because of its interdisciplinary partnership of founders: Lauri M. Baker, agricultural communications and journalism; Cheryl R. Boyer, horticulture; and Hikaru H. Peterson, agricultural economics. CREE is an institutional collaboration between K-State and the University of Minnesota. Additional team members include Allison Wakefield, intern and current ACJ student, and Mikhayla DeMott, audience engagement specialist and 2017 ACJ alumna. 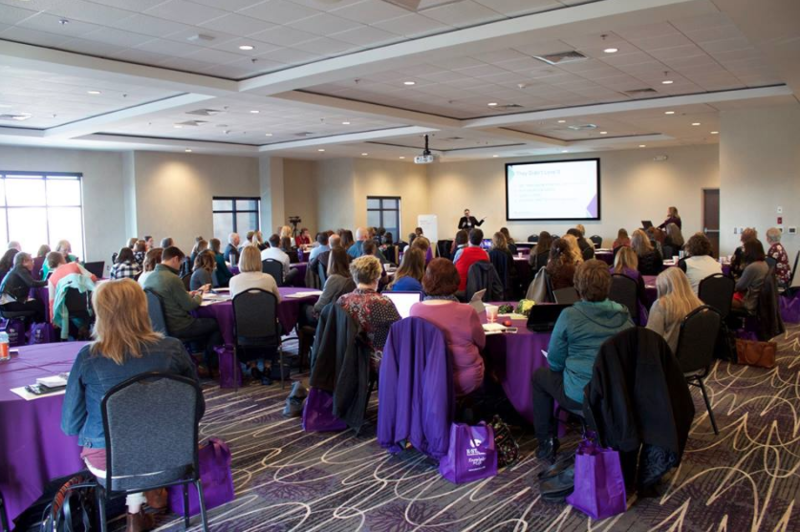 The Insight Summit, previously known as the New-Media Marketing Boot Camp, was February 12 and 13 at the K-State Alumni Center. A group of international students and researchers from Cambodia and Senegal arrived in Manhattan, Kansas, on October 11 to begin their U.S. agricultural experience. 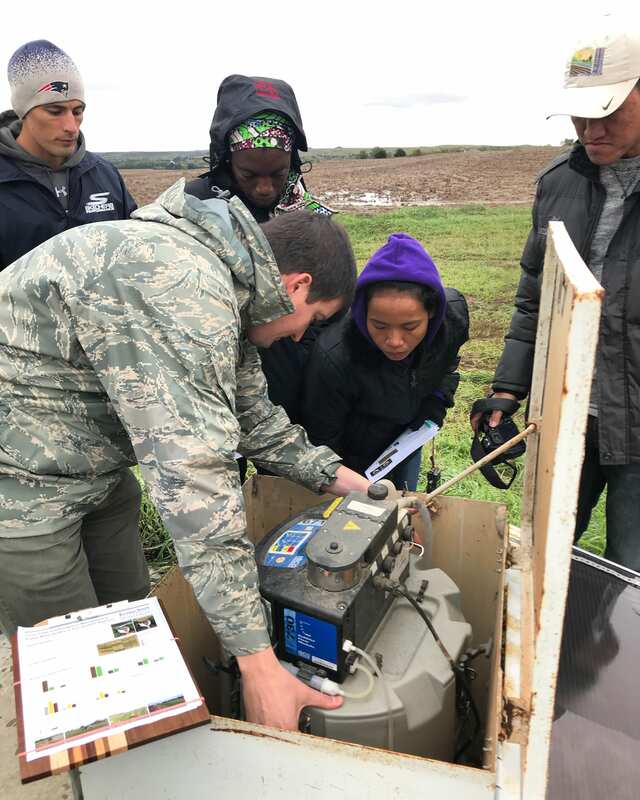 Kansas State University’s Sustainable Intensification Innovation Lab (SIIL) hosted the group before the World Food Prize events in Des Moines, Iowa. 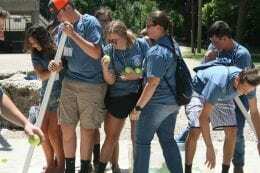 While the international guests were in the Little Apple, the SIIL team provided a glimpse of Kansas agriculture in a variety of settings. Dan Devlin, director of the Kansas Center for Agricultural Resources and the Environment (KCARE), set up farm tours for the SIIL group to see U.S. agriculture up close and in action. Their first stop was River Creek Farms, which started in 1890. Brothers, Joe and Bob Mertz, discussed how they operate and manage the family farm using a crop and livestock integrated production system and the challenges that face U.S agriculture. 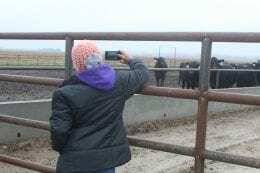 This conversation posed an exciting opportunity for a bidirectional learning opportunity, where both native Kansans and international participants shared stories about different production practices used globally, including antibiotic use in livestock, livestock genetics, the use of GMOs, and the cost of farm products. 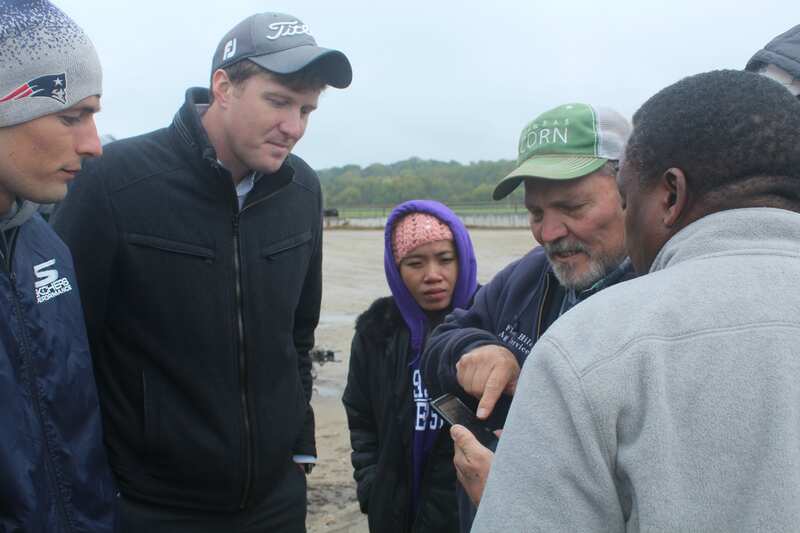 After a traditional U.S. lunch at Manhattan’s local Tallgrass Tap House, Devlin took the group to see the research side of Kansas agriculture – K-State’s agronomy department research plots. Elliot Carver, an agronomy doctoral student, led the tour. The plots are used to test multiple dimension of cover crop practices, and participants were able to discuss how Carver is applying his research to everyday farming questions and concerns. Campus SIIL faculty and their colleagues from Cambodia and Senegal participated in a panel discussion on youth engagement and capacity building at the World Food Prize in Iowa on October 18. Kelsey Tully is the social-media assistant for K-State’s Sustainable Intensification Innovation Lab. 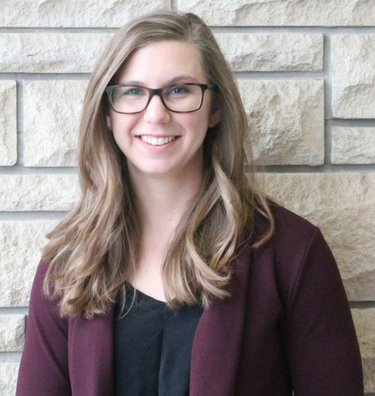 Cassie Wandersee has moved from her role as research assistant with the Center for Rural Enterprise Engagement (CREE) to a role with the communications and agricultural education department. In her role with CREE, Cassie created social media and blog content, webinars, participated in public speaking events, workshops and gave conference presentations. This fall, as part of her new job, Cassie will be teaching AGCOM 590 – New Media Technologies. She will also be assisting with social media planning and implementation. She is now located in Dole Hall and working closely with Megan Macy through the News Media Services team. 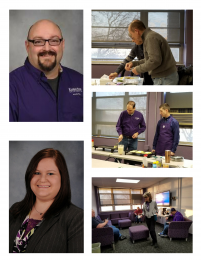 “I am excited to work more closely with K-State Research and Extension and our state 4-H group. Social media is key to reaching many audiences across Kansas, I hope I can put my skills in social media analysis and planning to good work,” Cassie says. Cassie completed a bachelor of fine arts and minor in mass communications in 2012 and a master’s degree in agricultural education and communications in 2016 at Kansas State University. The Center for Rural Enterprise Engagement (CREE) recently hosted the New-Media Marketing Bootcamp at the Bluemont Hotel in Manhattan, Kansas. 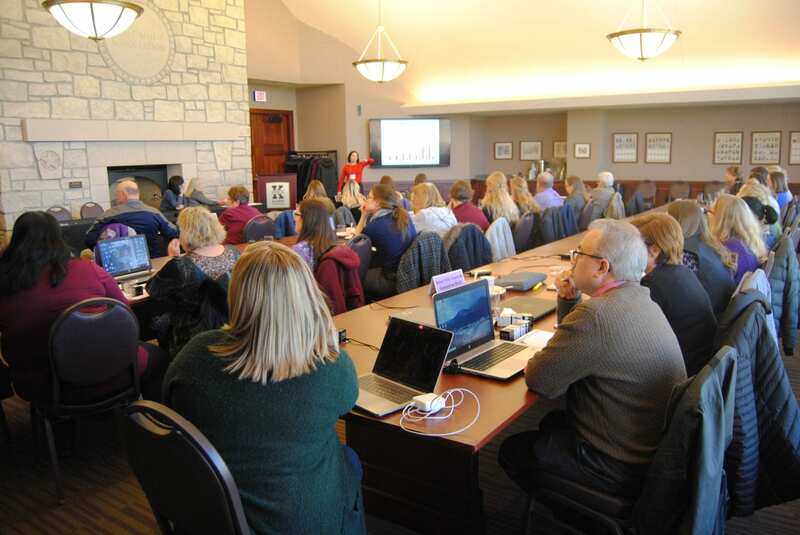 Small and rural business owners, communication professionals, and K-State Research and Extension employees came together to build social media strategies, while learning new skills and creating content. 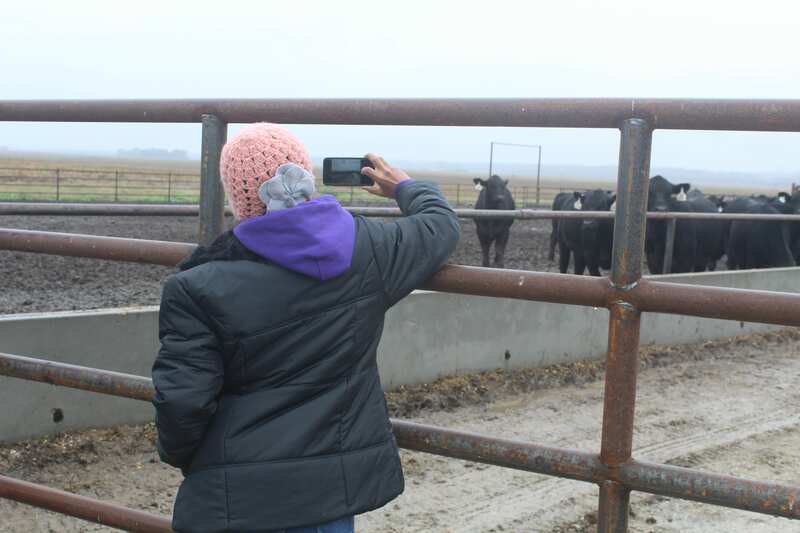 “Building relationships and trust is crucial to success as a research and extension communicator,” says Donna Sheffield, publishing editor at K-State Research and Extension. Growing up on a farm in Georgia, Sheffield says she can recall her father approaching their local extension agents with questions concerning their operation and relying on them for their expertise. From her observations, she realized the importance of having access to knowledge and research, especially about agriculture. “I really value extension, what it has down for rural America, and what it is doing. Farming is not an easy way of life,” she says. Today, farmers experience many challenges from fluctuating crop prices to weather phenomena such as wildfires and hurricanes that damage homes and arable land. Sheffield’s father grew up during the Great Depression, in a time when farm life was similarly challenging. Climatic weather events like the Dust Bowl damaged soil and crops, causing intense economic stress on farmers. Sheffield’s family continued their involvement in the agricultural industry throughout her life. On the other hand, Sheffield’s position involves editing publications before they reach the extension agents. She works specifically with the animal science, horticulture, and entomology departments at KSU. “My job is to translate [their] research into layman’s terms,” Sheffield says. The department congratulates Rick Butler and Phylicia Mau as Department Employees of the Year through a nomination and review process. Each received a plaque, and their names have been added to the plaques in the conference room in the main office. vided electronic files before plate output, completes customer-requested design work, and provides prepress design consultation for clients. ts with graphic design assistance, including page layouts, logos, artwork, posters, electronic publications, and other visual displays. She creates designs and images for print and electronic use. These awards were announced at the Groundhog Day breakfast celebration. Pancakes and sausages were enjoyed by all. Although Amanda Tomlinson did not initially plan on a career in agricultural communications, the field has given her many opportunities. Tomlinson has been working as an editor for the Publishing Unit in the Department of Communications and Agricultural Education for the past two years. 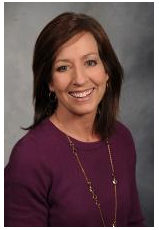 She edits and publishes research reports created by Kansas State University faculty. The faculty that she edits for receive research funds from the Kansas Agriculture Experiment Station, which include agricultural experiment stations located throughout the state. Before these faculty submit publications to outside journals and papers, she reviews the manuscripts to ensure correct formatting and grammar. “My role is helping faculty get their message out there by editing, printing and publishing their work so that farmers, producers, and others can read the material,” says Tomlinson. The Center for Rural Enterprise Engagement (CREE) is advancing its mission through outreach and training events on marketing and communications for audiences throughout Kansas and beyond. These events range from webinars and Facebook live videos to seminars and the annual New-Media Marketing Boot Camp. “We remain focused on empowering people to feel comfortable using new-media marketing tools. Whether it’s Facebook, a newsletter, or a blog, we want people to understand the platforms they working in,” says Cassie Wandersee (’16), managing director of CREE. Recently, CREE collaborated with partner organizations to host several events and webinars. One of these partnerships is with the Marketing Learning Community of the Association for Communications Excellence (ACE). CREE began working with ACE to host bi-monthly webinars that focus on training participants in communications theory and practice. During the last webinar, they discussed content strategy and planning for small businesses and service organizations. Co-creater, Dr. Cheryl Boyer and Managing Director, Cassie Wandersee presenting at the K-State Research and Extension Annual Conference. CREE has also partnered with K-State Research and Extension. 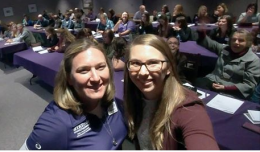 Dr. Cheryl Boyer and Wandersee presented on content strategy and communicating through multiple channels at the K-State Research and Extension Annual Conference in November. It is also working with Kansas Pride on an online seminar in January focused on launching e-commerce stores. This webinar will discuss the benefits, as well as the preparation needed, for creating an online store. In the basement of Umberger lies the K-State Research and Extension Bookstore and Mail Center, which supports both KSRE and the College of Agriculture by managing and distributing more than 2,000 publications, promotional materials, and other items. Publications are available online and available in print for a small fee. These items can all be accessed through the bookstore website, www.bookstore.ksre.ksu.edu. 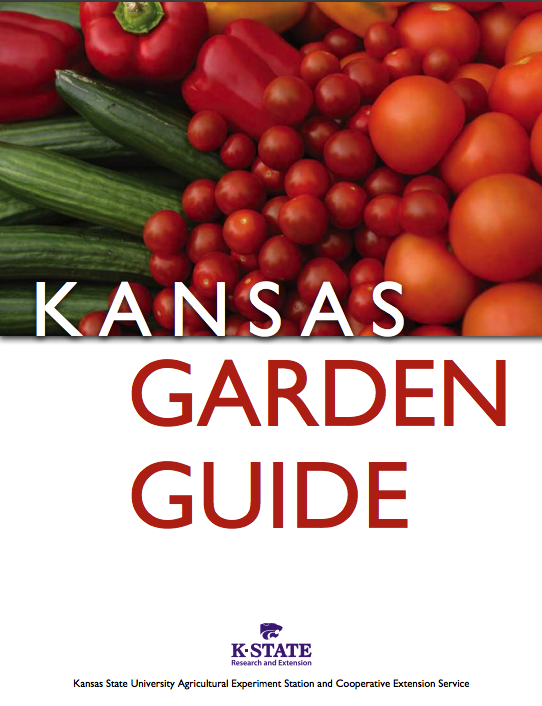 The featured publication for October is the Kansas Garden Guide – an 80-page guide to all things vegetables and herbs. 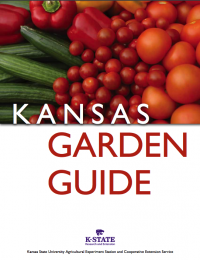 This guide has everything you need to know about soil, compost, seeding, watering, pest control, container gardening, season extension, harvesting, and storing.